Bluetooth Analyst is a simple but powerful tool for understanding and helping to fix Bluetooth issues. Whether in a public place or the privacy of your home, Bluetooth Analyst lets you discover nearby Bluetooth devices, get detailed information about each detected device, pair and unpair Bluetooth devices. A device list quickly shows you all detected Bluetooth devices in real time. Then tap on the name of the device for comprehensive detailed information. Just like our popular WiFi Meter app, Bluetooth Analyst makes complex technology easy to understand with simple visuals, audio feedback, and extensive text explanations. A signal level meter lets you locate devices and find the best signal. Geiger counter style audible clicks beat faster as the signal improves � making it easier to find the best connection. 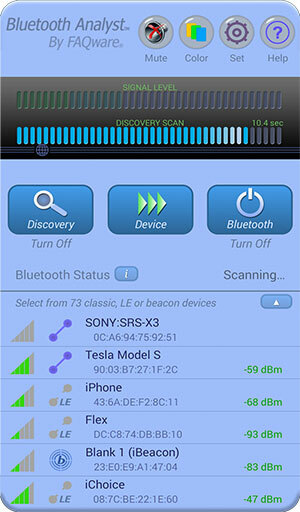 Bluetooth Analyst can be installed on an Android phone or tablet that has Bluetooth hardware. Bluetooth 4+ required for seeing low energy devices and beacons.